I found this recipe (via Fun Recipes and Life Stories) towards the end of last winter. Can't believe I never posted it before ~ Duh Keeley! I even mentioned it when I gave Little Miss leftover is her Pow Wow Fall Bento (click respective names to see links). Well, I put it in the crock before work this AM and mmm, the BEST to come home too! Somehow this meal is completely filling, but not heavy by any means - my favorite kind! Warms the belly right up on those cold days/ evenings. On your stove top, brown your beef and mix in your seasonings - garlic salt with parsley & seasoning salt. While this is cooking, spray your crock with cooking spray. Then add in your carrots, potatoes, onion, diced tomatoes, and chicken broth. Once the beef is done browning (it doesn't have to be 100% - it will cook up the rest of the way in the crock), drain and add the beef to the crock. Another successful dinner complete when I walk in the door. Beefy! 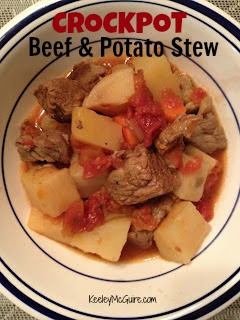 I'll have to save this one for when my hubby is working late or is outta town :) I do love a beef stew!